74 • RV PRO • September 2018 rv-pro.com R V M A N U F A C T U R E R S GULF STREAM Gulf Stream Coach will showcase more than 60 units at its convenient central location along Executive Parkway near the RV/MH Hall of Fame during Open House Week. Among those units, Gulf Stream will be highlighting the all-new twin-bed BT Cruiser model 5255, and the biggest-ever Ameri-Lite, the new 281BH. The RV maker also will feature a new Cabin Cruiser floorplan, perfect for RVers who love the charm of the Vintage Cruiser, but need more space for their family. Additionally, dealers can check out seven new floorplans for the new GEO line of laminated travel trailers, aimed specifically at the surging Millennial and first-timers market, with state- of-the-art technology, styling, and features. Meanwhile, Gulf Stream will highlight new paint schemes, graphics, interiors, fabrics, and features across all products lines, including its conventionally constructed Ameri-Lite, Conquest, Innsbruck, Kingsport, and Trailmaster brands; its laminated "V-Class" Vintage and Vista Cruisers, and its BT Cruiser and Conquest motorhomes. Dealers are invited to join Gulf Steam personnel for lunch or dinner while visiting the company's display. The RV maker will have a huge tent in its space big enough for dealers to relax out of the sun (or rain), with tables and chairs and featuring refreshments and snacks. Notably, dealers can visit the display at the end of the day as well, as Gulf Stream will have stadium lighting, allowing attendees to explore the company's offerings through the eve- ning, when crowds are smaller and temperatures are more comfortable. Gulf Stream also will be offering giveaways and prizes for dealers who look at the company's products. Details on the give- aways and prizes will be available in the display during the show. All Gulf Stream key management personnel will be on-hand through Open House Week, so dealers will have a chance to get to know the people behind the family-owned RV manufacturer with a 35-year track record. NEWMAR After a hiatus last year, Newmar will be participating in Open House Week again this year. 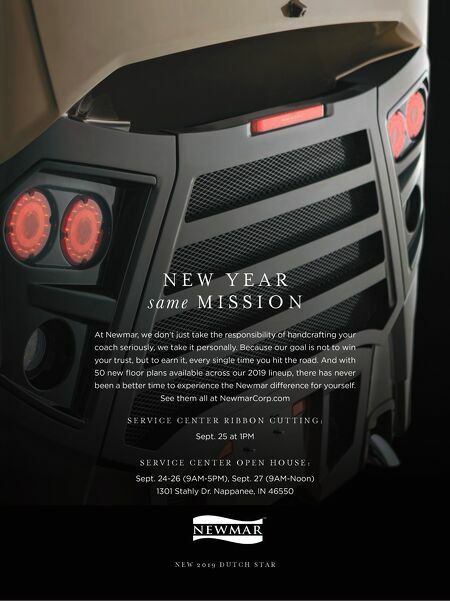 However, rather than occupy a space near the Forest River Dynamax plant, as it has done in previous years, Newmar this year plans to host a somewhat more low-key event with a display at its new, state-of-the-art service center, located at 1301 Stahly Drive in Nappanee, Ind. "With strong retail demand for our 2019 brands providing our company with a record-setting backlog, I felt strongly that it would be great this year to host our open house at our new service center," Newmar President Matt Miller says. 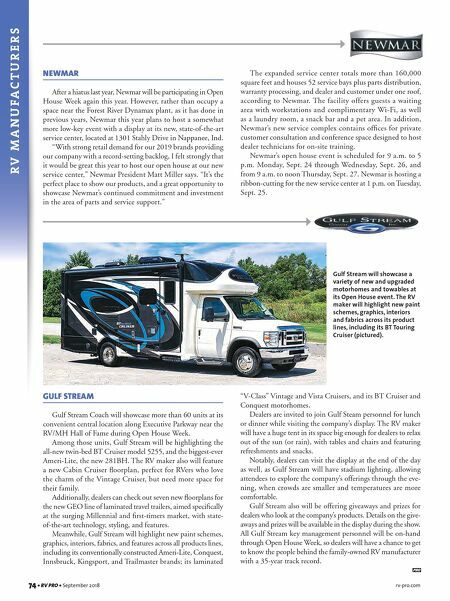 "It's the perfect place to show our products, and a great opportunity to showcase Newmar's continued commitment and investment in the area of parts and service support." The expanded service center totals more than 160,000 square feet and houses 52 service bays plus parts distribution, warranty processing, and dealer and customer under one roof, according to Newmar. The facility offers guests a waiting area with workstations and complimentary Wi-Fi, as well as a laundry room, a snack bar and a pet area. In addition, Newmar's new service complex contains offices for private customer consultation and conference space designed to host dealer technicians for on-site training. Newmar's open house event is scheduled for 9 a.m. to 5 p.m. Monday, Sept. 24 through Wednesday, Sept. 26, and from 9 a.m. to noon Thursday, Sept. 27. Newmar is hosting a ribbon-cutting for the new service center at 1 p.m. on Tuesday, Sept. 25. Gulf Stream will showcase a variety of new and upgraded motorhomes and towables at its Open House event. The RV maker will highlight new paint schemes, graphics, interiors and fabrics across its product lines, including its BT Touring Cruiser (pictured).